I'm in love with all things farmhouse right now, and I'm always trying to think of inexpensive ways to add accessories to my decor that have that farmhouse feel. I've also always loved the bright colors and bold artwork of vintage food can labels. When I purchased some recently online I wasn't sure what I'd do with them, but I knew they'd come in handy one day. 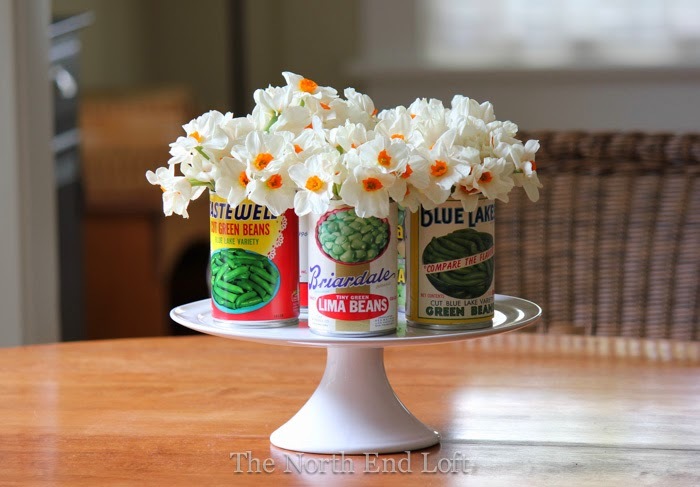 When I found myself looking around for a vase for some daffodils yesterday, I thought of my vintage labels. 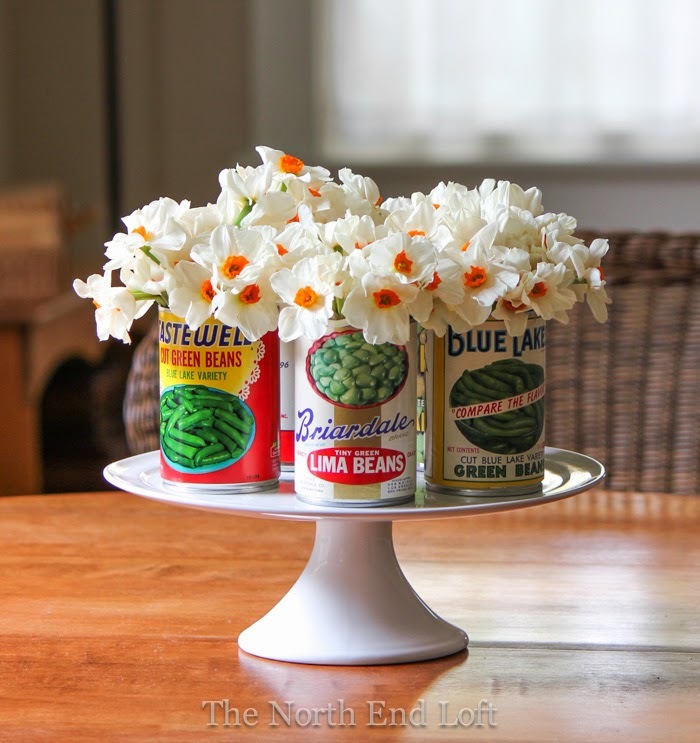 I glued the labels onto some empty cans I had saved up for painting projects, filled them with water and dafodils, and grouped them on a cake stand on the dining room table. I just love the way the bright colors of these vintage labels pop against the new neutral paint color on our dining room walls. I think they'd look cute in the kitchen too, don't you? They're definitely saying "farmhouse" to me! 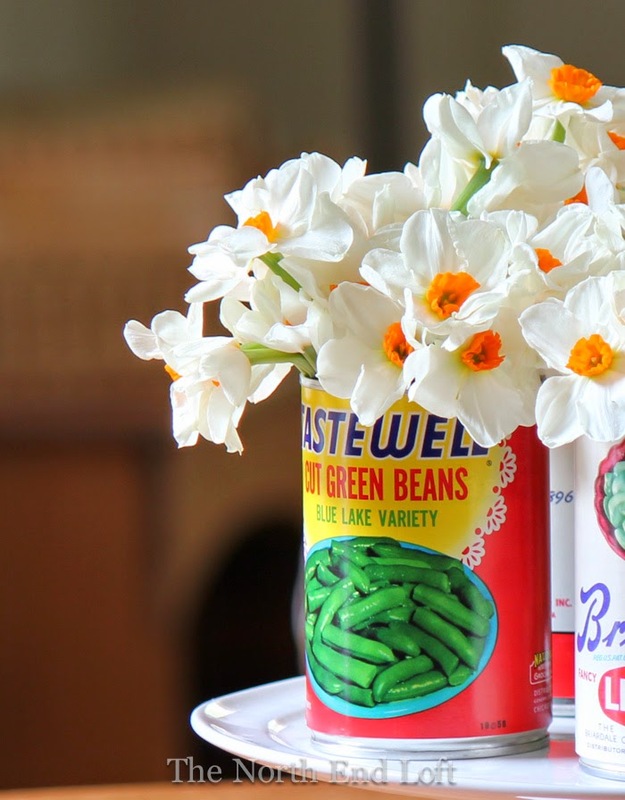 I'm so glad you popped in to see my vintage farmhouse tin can vases. Totally adorable! I love the vintage graphics and they look so sweet grouped on the cake stand! Perfect for your gorgeous kitchen! Beautiful, cheery and so farmhouse!!! I love this idea, they're simply adorable! Very sweet! Never would have thought of it, but I sure like it! These are too sweet. They look so cute all together. Wonderful idea. They are adorable! I love your home! How pretty, Laurel! This is a beautiful idea! It's perfect Laurel! That pop of color is perfect with the white flowers! Laurel these are just too cute and I LOVE the daffodils!!!! They would be perfect in the kitchen. How do you come up with these ideas? I love it! 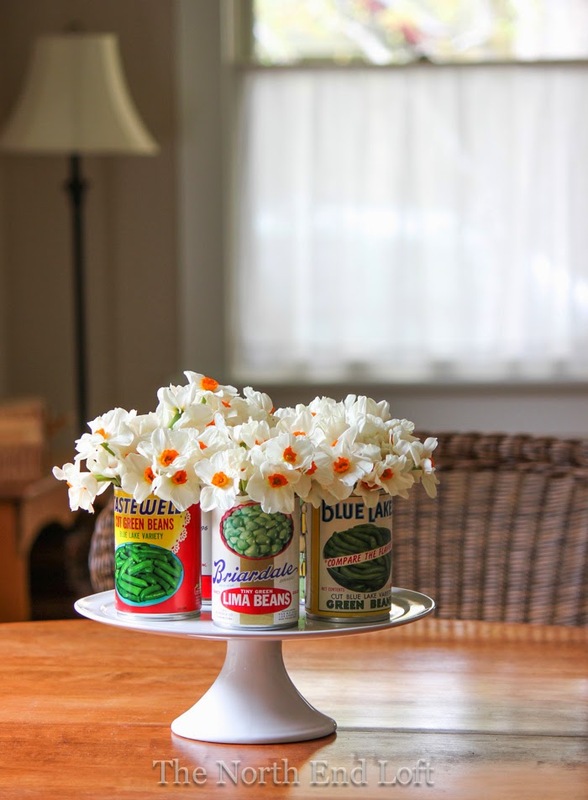 So simple, yet so homey - and I never would have thought of it! Really cute look! Thanks for sharing! I love this! The colors are so bright and cheery! 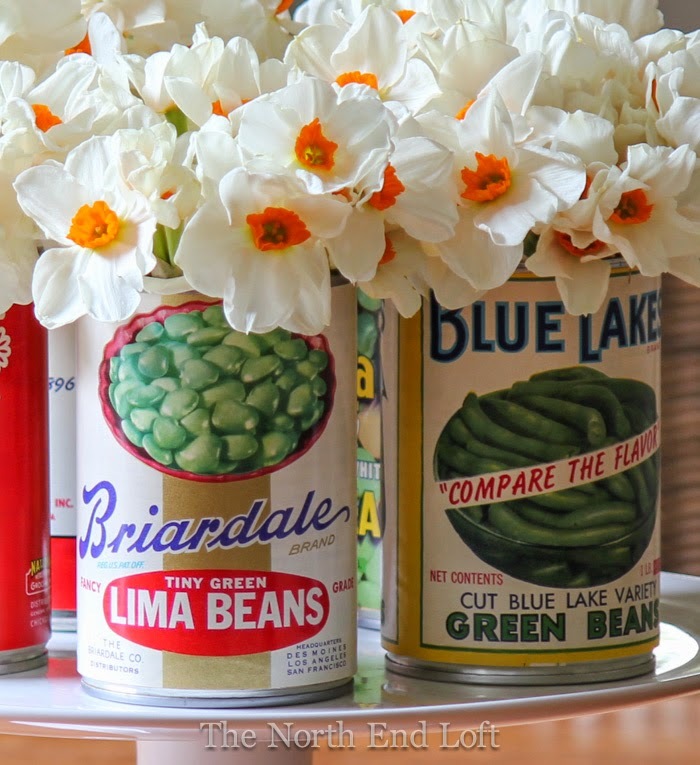 I love these tin can vases! So clever and so cute! Got it pinned!! Those are so adorable! I must get me some vintage labels!